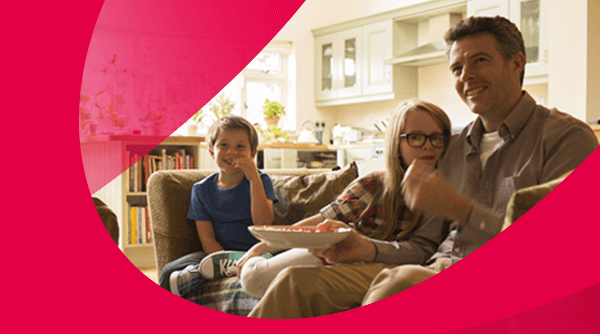 Watch all the channels in your eir vision subscription in a second room – a perfect solution for the kitchen or bedroom – great value at just €4.99 extra per month. If you're the type of household that can never agree on what to watch, eir vision multiroom is just what you need. eir vision multiroom boxes are compact in size and can do everything your eir vision+ box can except for record/pause/rewind. So you can watch all the channels you've subscribed to in one or even two more rooms. Compare the features of the multiroom box to the eir vision+ box. An eir technician will install your eir vision service at a time which suits you. They’ll run a full system check, give you a quick demo and leave behind a handy User Guide which covers every eir vision feature. To really enhance your eir vision experience you can connect it to a Home Theatre or Hi-Fi sound system giving you stunning sound quality. If you want to add any TV channel packs, Multiroom, or HD packs then call us on 1901 or touch the Live Help button and one of our web agents will add it for you.